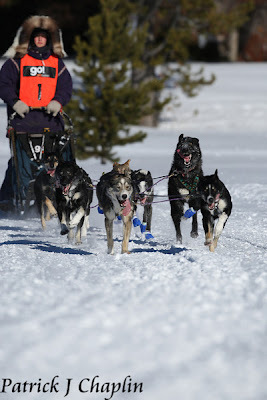 Originally, I had planned on both Dad and I running the 12-dog, 30 mile class at West Yellowstone this year since we had enough dogs to run two teams in the bigger class. 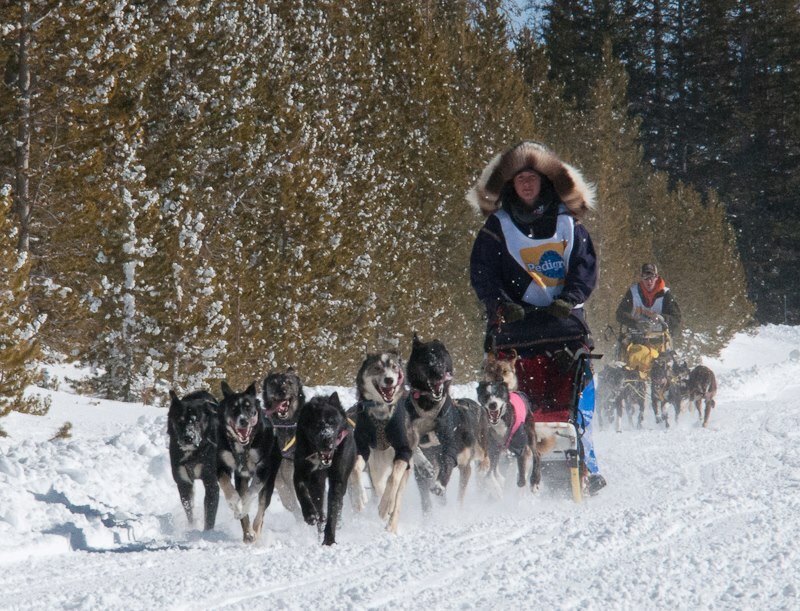 I was also hoping to have the dogs at that mileage, but due to the lack of snow, we ended up running the 8-dog, 20 mile class as usual. 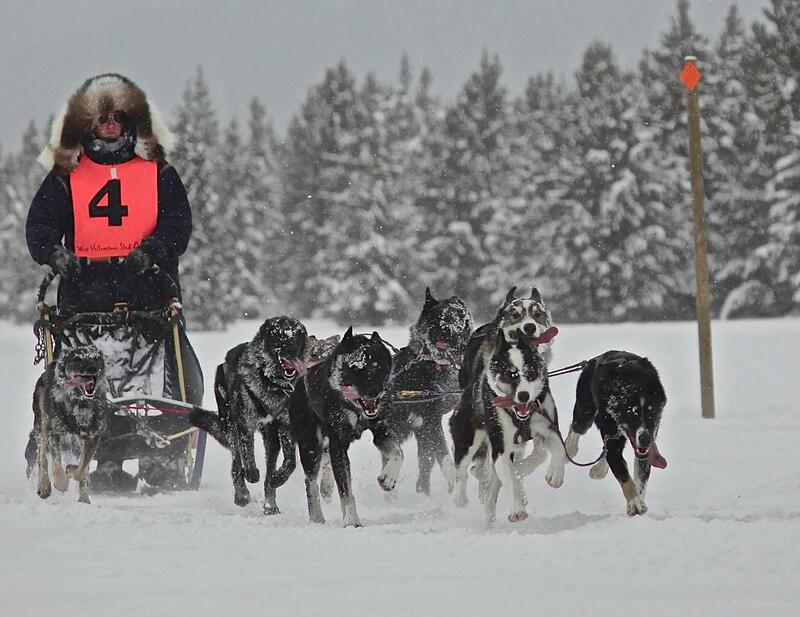 In fact, the race was almost cancelled because there wasn't enough snow! 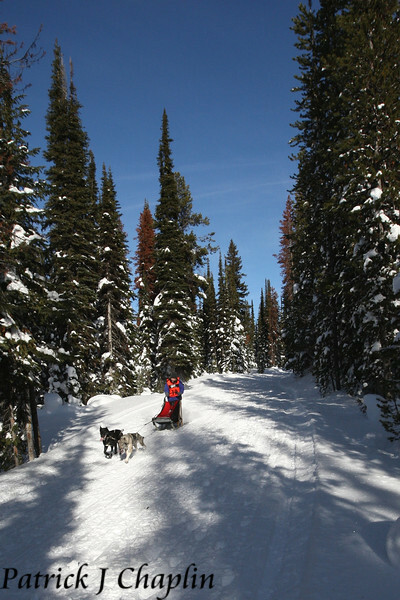 The last few years our trails near the Bozeman area haven't had enough snow at the time they usually do, but West Yellowstone usually has a lot more than us and has it a lot sooner. I don't think I have ever seen so little snow in West until this year. Fortunately, about a week before the race, we had a big snow storm that put a nice base on the race trail. Many mushers that were signed up originally for the 20 mile class ended up switching to the 10 mile class at the pre-race check-in. We were not the only one's who were experiencing an absence of snow. In training thus far, we had only gone 20 miles once, so I was a little unsure of how the puppies would do in not only their first race, but their first time doing back-to-back 20 miles. I was confident the adults would do well, since they all had at least one year of racing and conditioning prior to this season. My worries were quick to dissipate, as the puppies did super. If you didn't know better, you would have guessed them to be seasoned adults. I took the strongest team, and Dad to the "B" team which had all of the puppies except DiNozzo and McGee who had made the cut for my team. 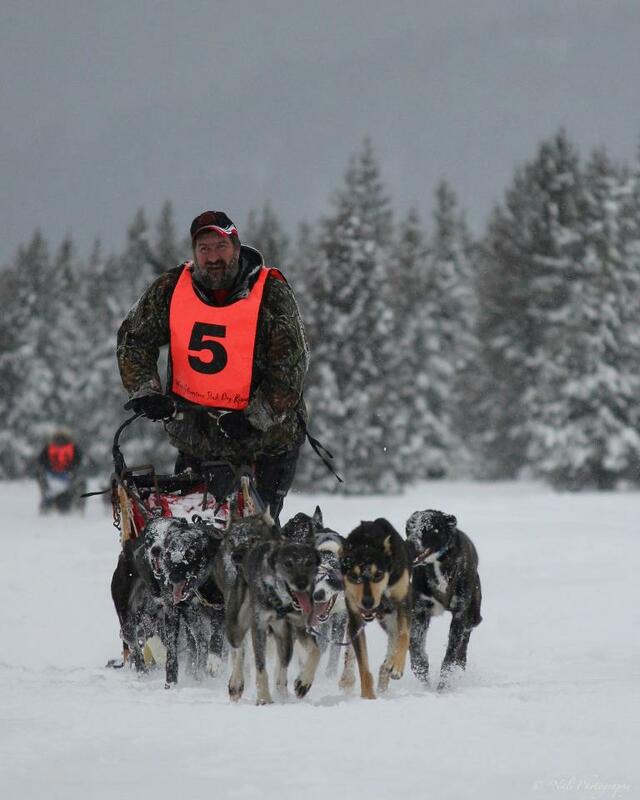 Dad's strategy was to take it nice and easy and make sure the puppies all had a good experience for their first race. My strategy was to be fairly conservative the first day, but to let the dogs go at the end of the run. The second day I would let them go sooner and try to possibly make up time on other teams. The dogs did great with this plan, and were 7.5 minutes faster on the second day. Dad's team was about 1.5 minutes faster on the second day. In my team, I had: Bella and Alice in lead, Emmett and Jasper in swing, DiNozzo and McGee in team, and Kaycee and Super Cub in wheel. Dad ran Khufu and Cessena in lead, Leah and Paul in swing, Ziva and Embry in team, and Seth and Quil in wheel. It was a great race to start off the season and give the young pups a taste of what was to come. All the pups did great, especially the two black boys who made my team and kept right up with the adult dogs. Overall, I placed 3rd and Dad placed in 7th. 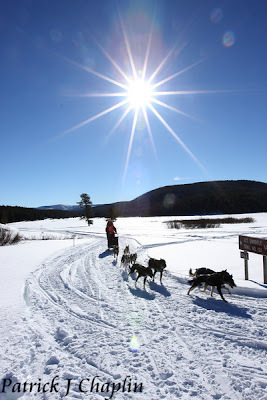 Next up would be the new Fun Run on another trail in West Yellowstone, a 35 mile one day sprint with a 10 dog limit. 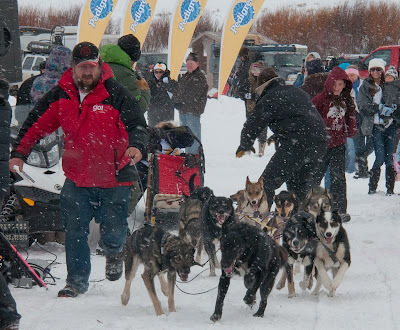 After the great run we had at Jr. Race to the Sky, I was really looking forward to a super run at the 2012 Jr. Iditarod. However, there are many curve balls in the sport of dog mushing. Because my family is so involved with the Race to the Sky, I had to stick around till the end of the 350 mile race instead of leaving right after the finish of the 100. Unfortunately, while we were hanging out there helping and watching the 350 mile teams, my dogs picked up a bug that was going through the teams. A number of the 350 mile teams had to scratch from the race because of this bug and I guess we had just stuck around long enough at the checkpoints to catch it too. I was able to get assistance from the race vets, and the whole team was started on antibiotics. Emmett also received IV fluids since his lack of appetite had caused him to start getting very dehydrated. After the awards banquet Wednesday night, we traveled home Thursday morning to get ready and pack for the trip to Alaska. Our original plan was to then leave on Friday, but we decided to delay our trip till Saturday in hopes that the dogs would start feeling better and start eating. When it was time to head north on Saturday, the dogs still were not eating well and still feeling sick. I had picked up a bunch of veterinary diet canned food from my wonderful vet, Dr. Sue Geske, and the dogs were at least eating that so I was able to keep them hydrated. We started our trip north and hoped the 5 days of rest and relaxation while traveling would help the dogs to feel better. Everybody was eating the canned food mixed with water, which was keeping everyone really hydrated; however, they still did not feel like eating much kibble. When we got to Alaska the dogs were starting to feel better and we were going to take them on a short training run to see how they would do running. Dad and I took the dogs to the Aurora Dog Musher's trail in Big Lake to run on the 10 mile loop. We double sledded with the 10 dogs since usually after traveling for days they are fired up to run again. It was not so this time. 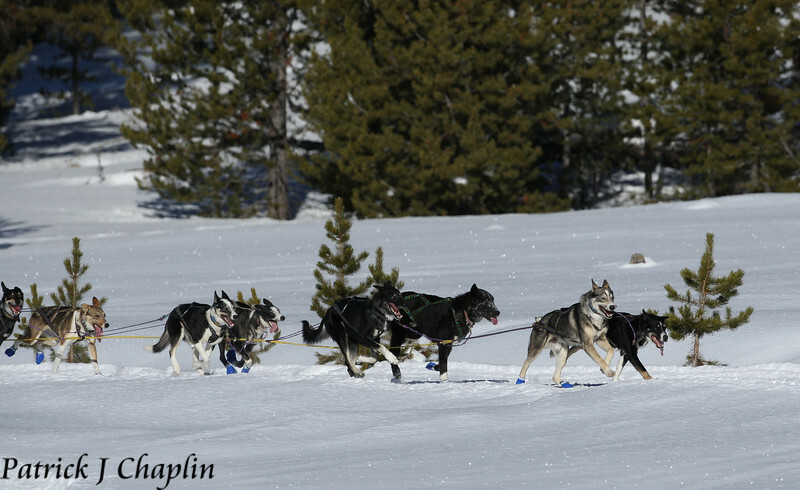 The dogs started out really well, but slowed down a lot and were just flat. It is probably one of the worst training runs I have ever had. They had no problem going, but were just very slow. At this point we weren't even sure if I was going to be able to run the race or if I should withdraw my entry. 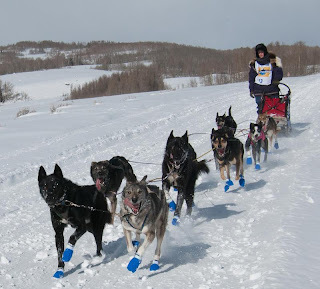 We decided we would keep running the dogs every day and see if they worked out of this funk. At this point they were happy and feeling better and were eating pretty well. Each training run we did was a little bit better and we decided that they would be ready for the race, and that hopefully they would be able to work out of the last bits of the bug during the start of the race. The only dog that was going to be questionable was Otter, but she had been having a bit of a hard time all year keeping up with the team since her C-section in August. Well, it was time for the vet checks and I was a little bit concerned since the dogs had lost weight when they were sick. However, the vets said they looked great and were in great weight. I guess they were in good enough condition before the bug hit us, that they were still in good healthy weight even after going off their food. 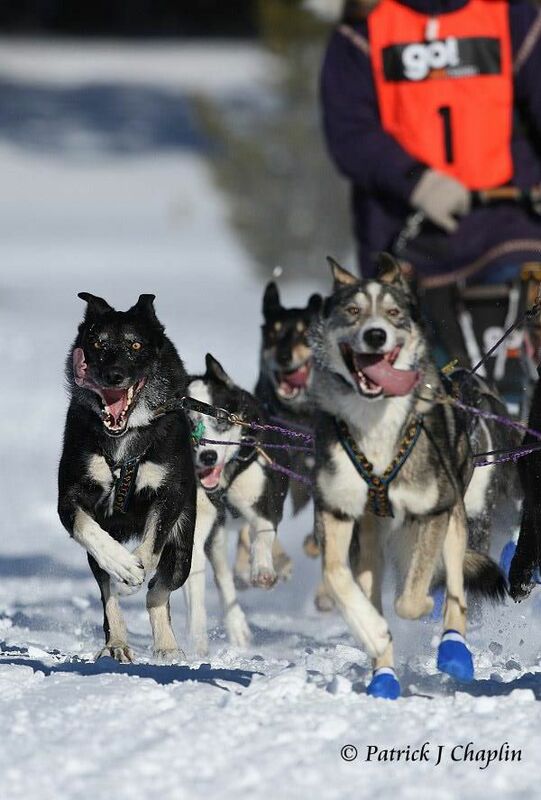 The dogs were feeling and happy and I could tell they were excited for the race. 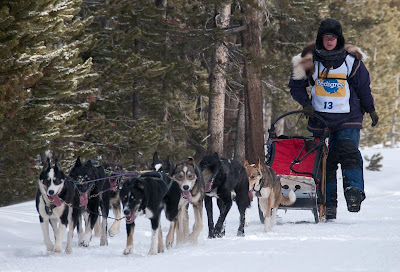 That night at the musher's meeting, I drew bib number 8, which I was happy with since it was pretty close to the middle. The next morning the dogs drank their morning water and meal like champions, they had their appetites back and were feeling good. Instead of taking the normal meat with me to feed at the checkpoint, I took the canned dog food that they had been eating well. I of course had my normal beef patties as trail snacks to feed them, but wanted to make sure I had something they would eat at Yentna. The race started out really well, the dogs were feeling normal again after a couple of miles and I was thinking they had worked through the little bit of bug that was left over, but at about the 40 mile mark, my hopes were squashed. I could kind of see that we had hit the wall, and the dogs slowed way down and were flat again. I had to stop and put Otter in the sled bag, but when I did that everybody was still happy, so that made me feel better. At that point I knew we weren't going to be pushing for 1st place, so I focused on having a good, happy run and maybe the dogs would be feeling better after our 10 hour rest at Yentna. I carried Otter in the bag the next 10 or so miles, which slowed down our speed even more. She was fine and was winning because she wanted to run. 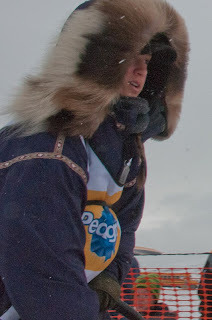 I had decided to bag her because she was just having a hard time keeping pace with the rest of the team, and I was going to drop her at the Eagle Song checkpoint, something that I knew before the race I might have to do. When we stopped at Eagle Song the dogs were all barking and wanting to keep going, so that made me feel better even though we were still going slow. I dropped Otter there and it is one of the hardest things I've had to do during a race. Otter always was with me from the start to finish of every race, she was my first lead dog, and she taught me so much the first couple years I was learning how to do longer races. She had a motherly personality and felt that she was responsible for keeping me and the rest of the team safe, but I knew dropping her was what was best for her even though she would never stop trying to keep up down the trail. We continued on towards Yentna Station, I knew it was a short and easy 20 miles, but I still felt that a part of our team was missing. I trusted that the crew at Eagle Song would be taking good care of Otter and the vet there had taking a special liking to her anyways. Once we got into Yentna, I was sitting in 7th place, which is not to shabby considering how slow we had been going. I got the team situated in our parking spot and began taking care of the dogs. I started the ice and snow melting in my alcohol cooker for water and began taking booties off the dogs and putting their dog jackets on to keep their muscles warm. Once the snow and ice had melted into hot water, I mixed up there canned food and a little bit of kibble. They all at really well, so I fed them all a couple beef patties out of my drop bag. I then started to melt ice and snow so it would be ready for my second feeding. I left the cooker to do its thing and layed out straw for the dogs and set to work on massaging with Algyval and putting wrist wraps on everyone. After all the dogs were massaged and sleeping, I made sure to eat and drink as much as I could, something that is a challenge with a belly full of nerves. At this point, it began to snow. It wasn't a heavy snow like I've experienced in Montana that just pounds you to the ground, but it kept coming down in huge, heavy flakes. After only a couple of minutes many inches had already collected on the ground! I made sure to put all my supplies underneath the sled so I would be able to find it if we got a lot of snow over night. We got more than a little bit of snow, I had to get out my rain gear and put it on because it was so heavy and wet. There were feet of fresh snow on the ground and we were only 1/2 way through our rest! At this point Kaycee had woke up and was being a wild woman like usual. Everyone else was sound asleep, including Ra and Cessena who were snuggled up next to each other under the branches of a pine tree we were parked next to. I was keeping a close eye on Kaycee as she was running in circles and squeaking to make sure she didn't decide to start chewing on her neck line or the gangline. 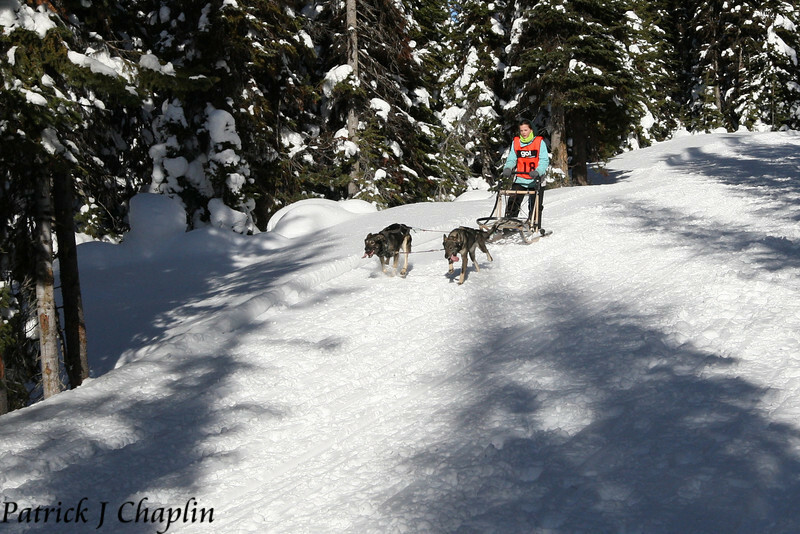 Instead of chewing one of the lines, she decided to grab one of the snow laden pine branches that was hanging over the team and began yanking and growling, shaking the whole tree. This tree had collected tons of snow since the storm had started, and being disturbed by Kaycee's antics, it dumped its whole load right on top of Ra and Cessena who were peacefully sleeping bellow. THUMP!!! Ra and Cessena flew out from under the tree covered in snow, and their expressions showed that they were clearly very ticked off at Kaycee. Kaycee's expression was of complete wow, and I could just hear her thinking, "Did I do that?" As I held back a chuckle, all three finally curled back up and went to sleep. 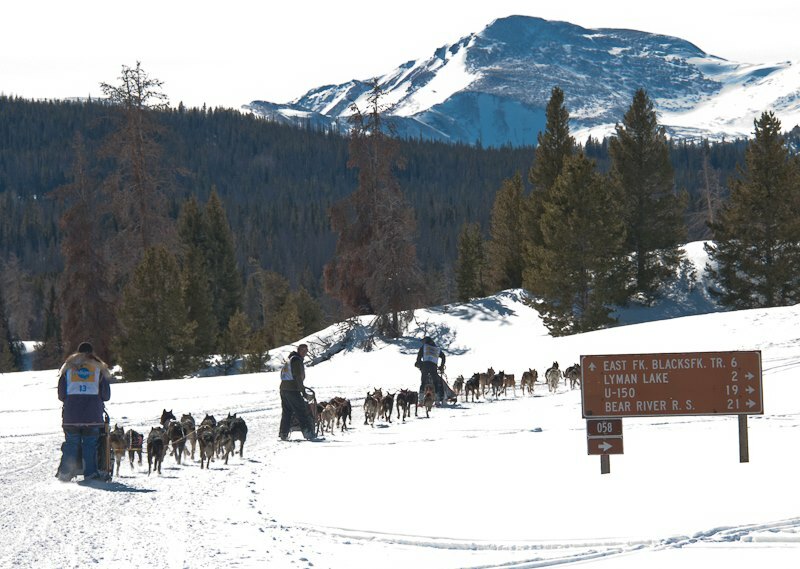 It was now 2 hours before I needed to leave the checkpoint, so I got out of my sleeping bag and sled and went to mix up a meal for the dogs. Everyone woke up and ate well again. 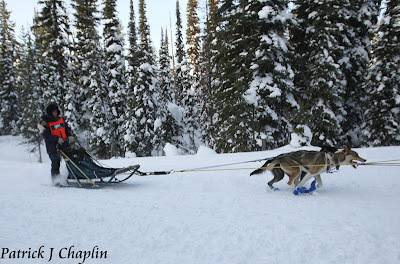 Once all were finished, I started to clean up all the supplies I had used and get them ready to load back into the sled. The snow was still coming down just as heavy as when it had started. I had pulled my outer layer of clothing off and placed it into a garbage bag when the snow first started falling, but I wasn't sure how long they would remain dry if the snow kept up at this rate during the run to the finish. I was also concerned that it would be like typical Montana weather: where dawn would come an end to the storm and a sudden drop in temperatures, freezing my wet clothing. Fortunately, we were in Alaska and this wet storm that came in off the sea was just spinning around on top of us dumping snow by the bucket loads with warm, wet temperatures. I made sure to pack all of the beef patties from my drop bags so that I would have lot's of snacks for a tough run to the finish with a hungry team of dogs that have just regained their appetite. We got out of the checkpoint on time and the dogs were feeling good as they set out down the trail. There was tons of snow on the trail, we had received 6 feet of fresh snow fall in the 10 hours resting at Yentna, and it was still snowing. At this point, it didn't matter that we were going slow because there was no way we could go any faster in these conditions. Leaving Yentna, there was a team about 100 yards in front of me, and the snow was already covering up their tracks. It was just starting to get light out when I went through Eagle Song, and I could see Otter camped with the other drop dogs watching us mush on through. I was glad to see that she was doing well, but I could feel her sad eyes following us down the trail as we left without her. We continued s-l-o-w-l-y down the trail, swimming through all the fresh snow. It seemed that the snow had let up a little bit and a dim glow of sun was working its way through the clouds. Snow machines were coming up behind me and going off the trail to get around the dogs only to totally sink into the fresh snow. The trail was only as wide as the dog teams, so the only way for the machines to get around was to brave the sea of white. Very few made it around without getting totally submerged, and though we were going slow, I was glad I was on a dog sled and not a snow machine. 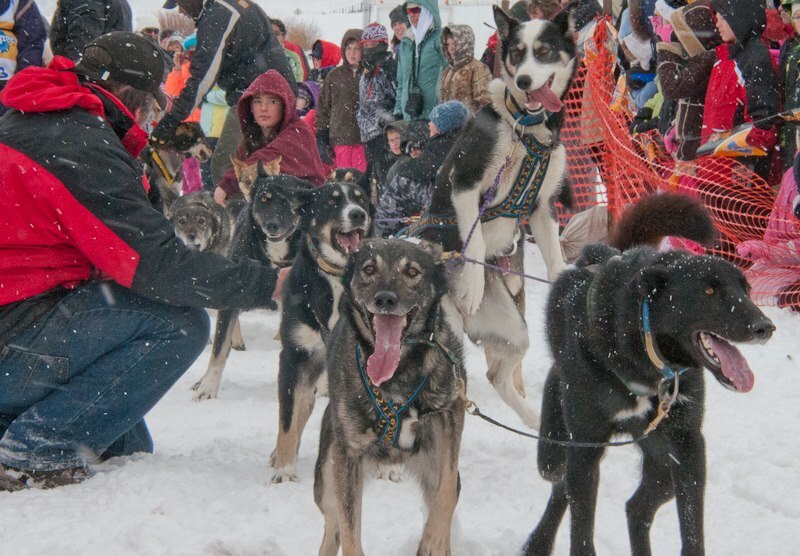 It's pretty hard to get a dog team stuck, even in very deep snow conditions. Every one was doing well except Alice, who had stepped in a moose hole and hurt her shoulder. 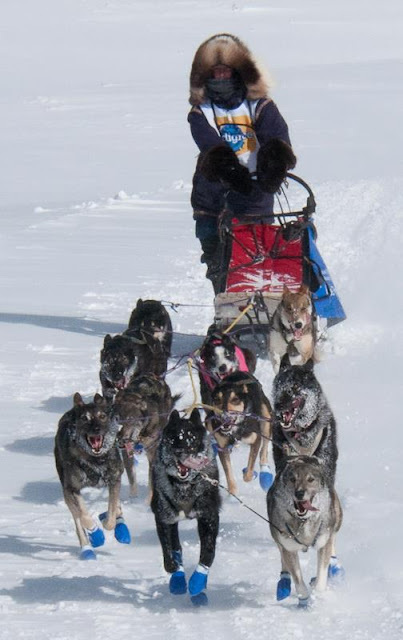 I ended up having to put her in the sled bag for the last 10 miles and put Khufu in lead with Bella. Khufu did great in lead until we caught up with Bailey V. and his team. 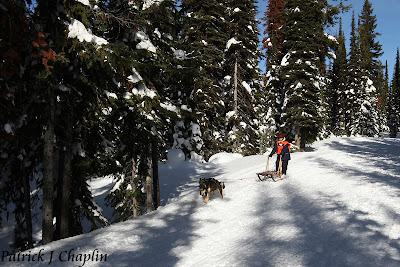 I tried to pass him but Khufu was far more interested with the girl dog Bailey had in his sled bag. 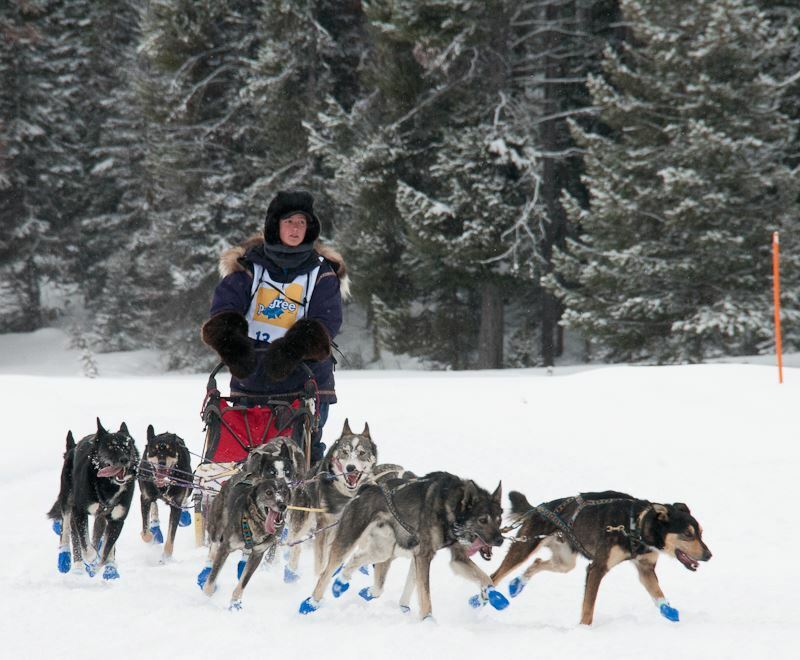 It was going to be difficult to pass anyway since the only way to get around the team was to go off into the deep snow. 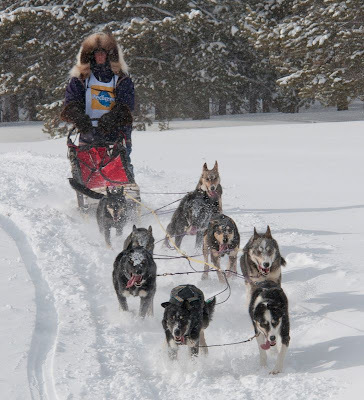 After some failed attempts with Khufu stopping every time to visit with Bailey's dog, I finally put Super Cub in lead who immediately took off into the deep snow and drug the whole team around Bailey. 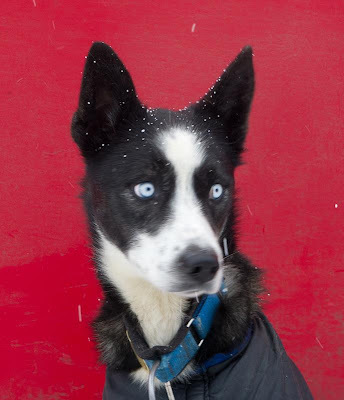 The snow was so deep that literally all I could see of Super Cub in front of the team was his little black-tipped ears sticking up out of the swirl of white. It was a long and miserable run. What should have taken about 7 or 8 hours took 14 hours. I was soaking wet through every layer of my clothing and my sled bag had given up on repelling the snow and water. I was starting to grow concerned because my dogs had never in their life run for so many hours. I was stopping every hour to give them beef patty snacks instead of my typical every 2 or 2.5 snacking schedule, but I was starting to run low on snacks. It was a good thing I took all the snacks I had, and fortunately I did not run out. We finally made it to the finish, and came across the line in 5th place. I was surprised at how well we finished, but with the all the snow on the last run, even the fast teams were going slow. When we stopped under the finish banner, the dogs started to bark and jump like they were ready to keep going. It made me so happy that even though I certainly did not want to go any further, they were still happy and having fun. I was so proud of them, not only were they recovering from being sick, but they also had to run through conditions that not even some Iditarod mushers have been through. Dad lead the team to the truck and I pulled Alice out of the bag and attached her back to the gangline while we gave the team all they wanted to eat and drink. We then loaded back into their boxes in the trailer and they were soon fast asleep. Because the race took longer than expected, I had to go in for the finish banquet right after taking care of the dogs and wasn't able to change out of my wet clothes. 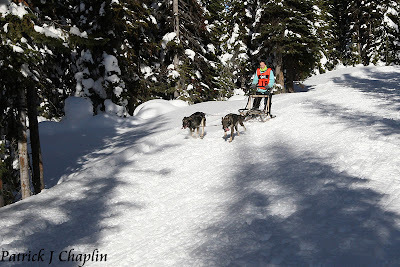 It was obvious sitting next to my fellow junior mushers that everyone was beat. It was good to have a hot meal and relax while awards were being handed out. When it was my turn to accept my 5th place trophy and prizes and thanked race organizers and all my sponsors, hoping I didn't sound as tired and exhausted as I felt. I returned to me seat and the race vet came up to present the Humanitarian Award. I was honored to hear that I was chosen by the race vets to receive this honor. I was so happy that I had been chosen, but more happy for how happy my team was at the finish line even though it was a tough run into the finish. Super Cub also received the Blue Harness Lead Dog Award, which was voted on by the other mushers. Even though he only led the last little bit into the finish, if it wasn't for him it would have taken a lot longer to get pass Bailey's team and on down the trail. After the banquet, we took care of dogs again for the night and I slept, it didn't take hardly any time for me to fall asleep and I didn't even dream. We rested for the next couple of days and then took the dogs out training a couple times just for fun. At this point they were fully recovered and back to their normal, speedy selves. I wish they had fully recovered before the race, but I could not be more proud of how my team did in the race. Something was still not right, because Otter had still not been flown back from Eagle Song. I was so worried for her, and every day we called to see if they had been able to fly the planes out yet. Because of the snow, all the dogs and volunteers that were at the two checkpoints could not get out by plane or snow machine. It wasn't until Thursday, four days after the finish of the race, that they were able to get planes in and out of the checkpoint. We drove to the Willow airport and waited for the plane that would have Otter. A couple planes flew in with supplies, people, and other dogs, but still no Otter. The minutes were ticking by slowly, but finally the last plane flew in and landed. There were a lot of dogs in this tiny plane and we started helping unload all the dogs. The last one out was Otter and she didn't recognize us at first, she just had this kind of sad expression on because she thought I had left her forever. Then, she looked up at me and the light bulb went on and she started howling and screaming and jumping all over dad and I. She was so happy to see us and the pilot came up and told us that she was the best dog he has ever flown in all of his years of volunteering for the Junior Iditarod and Iditarod. I took Otter back to the truck, and let her ride in the front seat curled up on my lap.